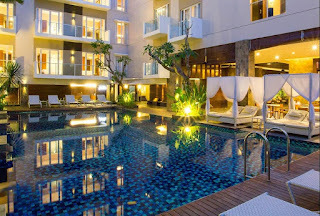 Grand Ixora Kuta Resort is a modern tropical hotel, located in the heart of Kuta, Bali. Our 4-Star Hotel, with its 134 rooms, is just a 10 minutes relaxed drive to Ngurah Rai Airport, Art Market, Kuta Square, Hard Rock Cafe, Kuta Beach and Beachwalk Shopping Mall. This convenience extends to easy walking access only 10 minutes to the Beach, Lippo Mall Kuta & Cinemax, Discovery Shopping Mall, Waterboom, and various restaurants that could satisfy myriad gastronomic fancies. Please send your update CV with current photograph and Application letter. Please mention the JOB TITTLE being apply at the subject email.